birthday cakes are sorry when the party is over? With the main event of their lives, the very reason for their creation completed the remains of the cake sit crumbling, dejected, lost? This cake has no reason to feel that depression that comes with natural decline and lack of purpose. I enjoyed the piece I ate just now every bit as much as the one I welcomed to my mouth during last night’s festivities. Fear not, my sweet friend. I have delicious plans for the rest of you as well. Hey, leave some for me! that looks like some chocolatey bliss! Is this the chocolate cake you made so long ago that was so divine that was called something like Death By Chocolate Cake? I still dream about that cake. Annie- no, it is not “the chocolate cake of life” That recipe has fallen out of myfavor as I haven’t been able to get it to come out right. I don’t know what I’m doing differently but it isn’t “of life” any more. 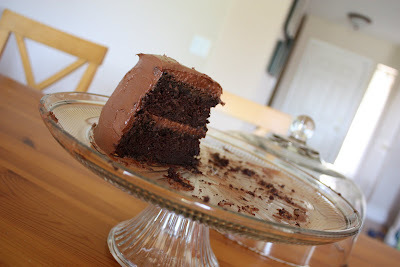 This is my new stand by, a revved up cake mix with homemade fudge frosting. That’s sad. It was SO good. This one looks delicious, too. Good thing my birthday is coming up.